Hey guys and welcome to another blog tour! So in this post I am going to be talking about the book, and then I have a special guest post from the author herself on her best and worst teen memories. But first, let's talk about the book! And also hated it (Round-the-head brace I am looking at YOU). 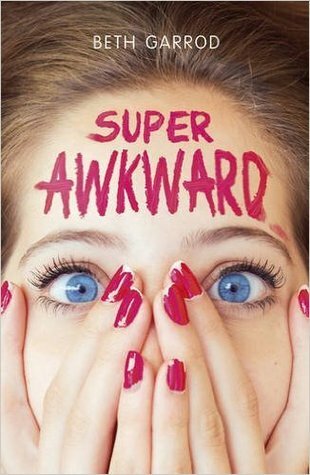 So, in honour of Bella, the main character in Super Awkward who in absolutely, definitely entirely fictional, here are some of my very best, and worst teen moments (that I definitely didn’t have to think for a long time about, because I definitely haven’t used any of mine in the book). Easy. Touching Declan Donnelly and then fainting at the Clothes Show Live. To be clear, this wasn’t a mutual touching – ie hug, embrace, handshake - it was the work of someone who was so excited he was walking in her vicinity, she poked him in the arm before she could take control of her muscle function. He probably didn’t notice. I, on the other hand, had to have medical staff bring me water. When Declan Donnelly didn’t notice me poking him in the arm, and instantly prove my theory, that if he only knew I existed, he might want to be with me. My first Glastonbury. Yes, I had to be creative with my age to get in and work six hours every day as a litter picker at 5am. Yes, we forgot wellies, but packed two entire rucksacks of Haribo and tuna. And yes, we may have crashed on the motorway on the way there (had to walk the last bit of the journey with everything in a shopping trolley we discovered in a hedge) BUT, it was the BEST time of my life. It was so rainy we had to dress entirely in our bin bags, and Debbie Harry called us ‘Wombles’ on TV. As if life couldn’t get any better, we also found a discarded Cumberland sausage half a meter in length. A constant cycle of being in love with people - as in, intense, almost alarming levels of love – for years, who I would rather disintegrate in front of, than actually speak to. Which, retrospectively, is not helpful, as achieving my goal of us falling in deep, lifelong love, would have meant a conversation at some stage. The day that my best friend and I finally learnt the entire rap to Ice Ice Baby. We didn’t have the internet – it was play/rewind situation until we’d figured it all out. It’s STILL a skill I use more than any of the French I learnt (although, Vanilla/Mr Ice, if you’re reading, I’m still not convinced by ‘waxing a chump like a candle’). Staying in a youth hostel with my friends in Dublin only to discover someone else’s crusty (as in, they had hardened into an ACTUAL FRISBEE STRENGTH ITEM) pants down the side of the bed. off and I had to wear the shoes for the rest of their life, with my own named signed across them. (We didn’t even get the band to sign anything either, and my BF and I had to make do with taking a floral hand towel from the venue that smelled of men’s urinals. Obvs it was too previous to wash, and I framed it, smell and all, for my wall). Knocking myself out by walking into a ceiling at my Saturday job. WHICH LED TO AN ACIDENTAL BEST BIT in that I wasn’t allowed to go to school for two weeks - because I’d done it with such force I’d caused temporary actual brain injury - and then I could catch up on Dawson’s Creek. Thank Goodness Netflix hasn’t been invented yet, or this would have the actual point at which I became a hermit and never looked back. Hmmm so that was a glimpse at some of my highs and lows. But I wouldn’t change of them. Except maybe not eating that kipper. And that's it for my stop on the tour. A massive thank you to everyone at Scholastic for letting me be a part of this.